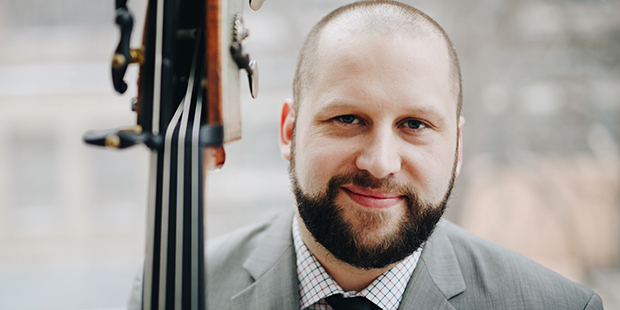 Toronto bassist Jesse Dietschi is a versatile musician and composer equally experienced in jazz, classical, and popular music. He holds an Artist Diploma from the Glenn Gould School (RCM, Toronto) in Orchestral Performance, along with Masters degrees in both Jazz Performance (U of Toronto) and Composition (Brandon University). Jesse is a faculty member at the Southwestern Ontario Suzuki Institute, St. Andrew’s College, and the Oakville Suzuki Association. He has appeared on international broadcasts including the CBC’s Sounds of the Season and NBC’s hit show Hannibal. Jesse is a member of the international touring ensemble Tunnel Six, contemporary jazz outfit the Nick Maclean Quartet, and has performed with Toronto’s Canadian Opera Company and Esprit orchestras. He has also performed, toured, and recorded with a wide range of artists, including The Headstones, Metric, the Gryphon Trio, Robi Botos, Ken Lavigne, Tapestry Opera, Irene Torres and the Sugar Devils, and Mexico’s Festival de Febrero. In 2015, Jesse performed in the Luminato Festival’s historic production of R. Murray Schafer’s Apocalypsis at Toronto’s Sony Centre. He has studied with Jeffrey Beecher, Andrew Downing, David Occhipinti, Stan Label, and Steve Kirby, and has worked in masterclasses with Joel Quarrington and Timothy Pitts.